A recent report published by Infinium Global Research on microarray market provides in depth analysis of segments and sub-segments in global as well as regional microarray market. The study also highlights the impact of drivers, restraints and macro indicators on the global and regional microarray market over the short term as well as long term. The report is a comprehensive presentation of trends, forecast and dollar values of global microarray market. According to report the global microarray market is projected to grow at a CAGR of 14.50% over the forecast period of 2018-2024. Product innovations in microarray technology has provided deep insight that for particular species, many arrays can be studied parallel. Moreover, product innovations also result in the adoption of microarray technique in healthcare and development of biological products such as vaccines and therapeutic proteins. Furthermore, innovation trends in DNA microarray development such as agilent technology, probe technology and glass arrays are anticipated to further drive the market. Emergence of microarrays in genomics and proteomics is one of the key factor driving the growth of microarray market over the forecast period. The genomics and proteomics technologies are used in gene expression analysis like expanding gene family size and discovering new categories of genes, mutation screening, genotyping and protein interaction studies. The report on global microarray market covers segments such as, product type, technology and application. On the basis of product type the global microarray market is categorized into instruments and consumables. On the basis of technology the global microarray market is categorized into protein microarray, tissue microarray, IOC and DNA microarray. On the basis of application the global microarray market is categorized into disease diagnosis and development, gene expression and other. The report provides profiles of the companies in the global microarray market such as, GE Healthcare, Illumina, Merck, Agilent Technologies, AXO Science, Thermo Fisher Scientific, Cepheid, Arrayit, Phalanx Biotech and Biometrix Technology. The report provides deep insights on demand forecasts, market trends and micro and macro indicators. In addition, this report provides insights on the factors that are driving and restraining the global microarray market. Moreover, IGR-Growth Matrix analysis given in the report brings an insight on the investment areas that existing or new market players can consider. The report provides insights into the market using analytical tools such as Porter's five forces analysis and DRO analysis of microarray market. Moreover, the study highlights current market trends and provides forecast from 2018-2024. We also have highlighted future trends in the microarray market that will impact the demand during the forecast period. Moreover, the competitive analysis given in each regional market brings an insight on the market share of the leading players. 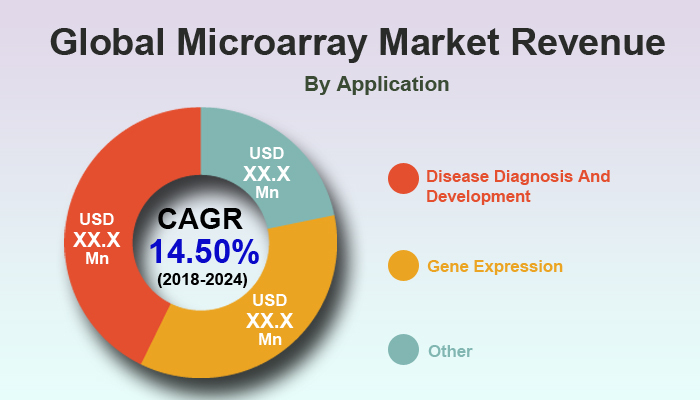 This report will help manufacturers, suppliers and distributors of the microarray market to understand the present and future trends in this market and formulate their strategies accordingly.